Introducing the "Weightless Wonder," the plane used to generate zero gravity. Four volunteers recently went on a zero gravity ride with the help of NASA in Houston – in the name of science. Imagine you’re flying in a plane, high above the Gulf of Mexico — and then you start to fall. Eight thousand feet in just 30 seconds. Next, that plane starts climbing back up, before making a plunge again. “And we do that 40 times,” says Dr. Benjamin Levine, Professor of Internal Medicine at UT Southwestern. On the flight last week, Levine monitored the parabola-shaped trajectory of the NASA plane from a safe distance. The goal? Figure out what’s behind a vision problem that affects astronauts. This hypothesis, that high pressure inside the brain is damaging the eyes, is what Levine was testing. Instead of sending people to the International Space Station, he’s using those fast swoops and dives of the plane as a chance to replicate the zero gravity experienced in space. And there’s another big difference between these test subjects and the astronauts who have the vision problem. These voyagers were all cancer survivors. Why? Because these cancer survivors have ports in their brains – ports once used to deliver chemotherapy – that now make testing the pressure inside their heads easier. 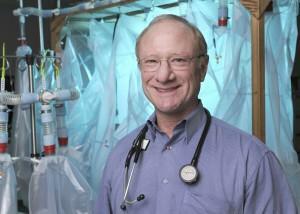 Dr. Benjamin Levine is Professor of Internal Medicine at UT Southwestern Medical Center. He is also Director of the Institute for Exercise and Environmental Medicine, a partnership between UT Southwestern and Texas Health Resources. Trent Barton, a lymphoma survivor from Dallas, went on the wild trip high above the Texas-Mexico border. Most important for this research, he had a needle in that port in his head monitoring the pressure in the fluid surrounding his brain. Remember, they’re testing the hypothesis that pressure inside the brain at zero gravity is so high it damages the eyes. It turns out the main idea was wrong. Levine says space flight doesn’t cause pressure to be much higher than it is when you or I are standing up. But it is a little higher. “So, we now think this mild but persistent pressure may be the thing that’s stimulating remodeling the eye and causing the visual impairment,” Levine says. See, unlike us, astronauts never get to rest their brains in lower pressure. As strange as it sounds, we earthlings have lower pressure most of the day when we’re standing – the blood is being pulled to our feet by gravity and the pressure on our brain is lower. Standing or lying down makes no difference in zero gravity. So researchers like Levine need to figure out a way to give these astronaut brains a rest. Cancer survivor and flight volunteer Wendy Schnaars. That might be just enough to lower the pressure slightly and give the brain a rest. “And that might prevent the remodeling behind the eye,” Levine says. OK, this is all cool and high-tech, but why does it matter to the rest of us? The first, Levine says, is we don’t want astronauts to land on Mars and be blind. Fair enough. Also, Levine says there are people on Earth who suffer from high pressure in the head (also known as intracranial hypertension). “And perhaps developing a sleep sack or pair of trousers that reduce the pressure at night may completely relive chronic headaches,” Levine says. Levine is also interested in patients who’ve suffered a traumatic brain injury and have slightly elevated brain pressure. Dallas cancer survivor Trent Barton says he’s thrilled to be a part of any solution. One bumpy ride at a time. The National Space Biomedical Research Institute (NSBRI) funded the research. There’s some big news coming out Friday from UT-Southwestern Medical Center: It’s been named a comprehensive cancer center. The private space business is booming, and Texas is a primary launch pad. For this week’s Friday Conversation, KERA’s vice president of news, Rick Holter, sits down with Ed Lu – a longtime astronaut who now has his own space company. Tuesday night's explosion of a rocket bringing fresh supplies to the International Space Station destroyed valuable cargo and a number of scientific experiments -- including one from students at a Rockwall middle school. It won't leave the ground, but it'll help lay the floor for a $12 million attraction at Space Center Houston - and NASA wants you to give it a name. Starting today at noon, Texans can christen a new high-fidelity Shuttle replica that will crown the 747 Shuttle Carrier Aircraft as part of a $12 million new attraction at the center.